Thread: Of Locks, Salesman samples, and Hannibal Lector- Welcome to my Tower of Locks! Over the last 5 years my detention lock collection has grown from less than 10 locks to more than 40 today. Through out it has usually been confined to a narrow entrance hallway to my apartment and mostly sat on a long narrow bench. I've keep it to the hallway mostly because I felt the locks were inappropriate for my primary living space. However the bench was always inadequate to hold even 10 locks, much less 45. Over the years I've had to come up with creative solutions ( and some merely expedient). One of my earliest locks is also my largest and too large for the bench. At 50 pounds, 18 inches deep, 10 inches wide, and 8 inches high, I had no place to put it but a dimly lit, bottom ledge of a curio shelf. This inappropriately enough was right next to my bed. Now even if you don't believe the sellers claim that this is one of the locks that held the one of the Biddle Bros. The ones who were set to be hung at the Allegheny County Jail in Pittsburgh, before Mrs Soffel famously broke em out (yeah that Mrs Soffel - the seller was a consultant on the movie staring Diane Keaton and Mel Gibson). The ones who died in a Bonnie and Clyde style shoot out. No matter what you believe- this Is Bad Karma! I needed a new spot for it. The massive W. Hall & Co jamb lock (which actually was a structurally integral part of the brick wall of its jail cell), needed to join it's homies and grab some bench. Toward that end, a year ago I added an Asian styled cabinet that was just big enough to hold the lock. The extra space initially allowed me to display other jail related items I had struggle to incorporate. One item was a very detailed scale model of a prison cell created appropriately enough by a death row inmate at San Quentin, complete with carved soap inmate figurine. This would sit next to the "Biddle lock". On top other an equally detailed scale gallows scaffolding would sit, made from cigarette boxes, complete with operational trapped door lever- and ready coffin, with lining made from bandage gauze. This created a scene where the prisoner would symbolically exit the Hall lock, then climb the Hall lock to the scaffolding. This display was a bit too effective or affective. The gallows stood out sitting so high and you could see them from outside my apartment door as I would enter/ exit my apartment. My apartment being right next the elevator, I would wind up in awkward conversations on the way down about why I had a gallows in my apartment. That configuration lasted about a month, before I somewhat reluctantly dismantled it. Always pressed for space, the W. HALL lock became a good place to display other locks, with its huge surface area. Today I would estimate there is over 80 pounds of locks sitting on top of it. There's 6 locks on top- many of which are humongous in their own right. There's a Folger series 50, which is one of the largest locks in current production at 35 pounds, there is Yale's "mini" version of a built into the wall jamb lock at 12 pounds. 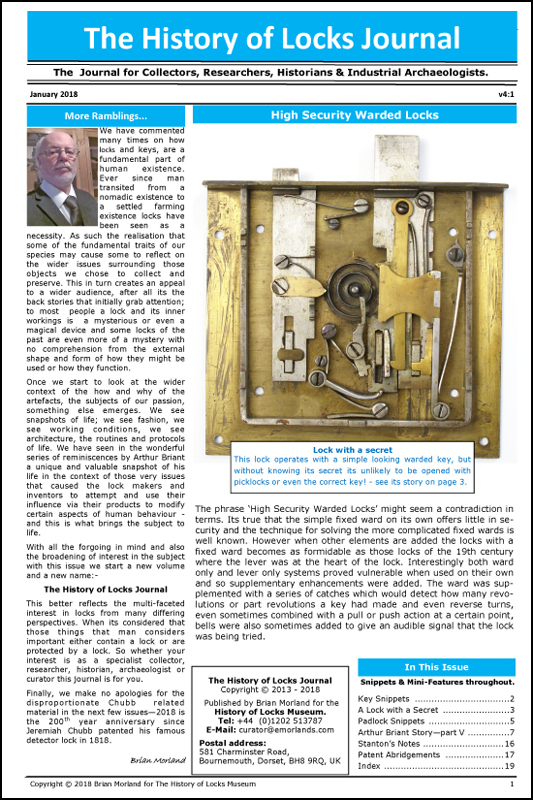 There is a display mounted Sargent Greenleaf automatic deadbolt slam lock with heavy armored plate at 16 pounds (I have another unmounted version of this lock. The Mossman Collection has a salesman sample of this type of lock). An Adtec series 60 salesman sample at 11 pound and FA series 80 with custom mogul cylinder modification at 8 pounds completes what I call the Tower of Locks. It's also allowed me to incorporate two scale model prison transport vehicles. The NY Police transport is pretty detailed with operational steering wheel, a prisoner compartment with Tower style leg cuffs, and creepy Mario Bros looking, prison guard rubber figurine. The Pennsylvania transport comes with chicken wire- so all you friends and neighbors can mock you on the way to prison. One thing I have always wanted for my lock display was an actual prison door- which really isn't realistic in an apartment setting. So three years ago, I thought about adding window bars to give my collection context. But I never thought I'd acquire an entire prison window frame, complete with shutters. This window allegedly came from a Texas jail. It is made of extremely hard wood, and is held together not with screws or nails, but interlocking wood pegs. A Southern Steel Mogul salesman sample beyond the shutters creates an altar like display. A month ago, however the Idea of having an actual swinging door became more pressing to me. I had acquired a NS-400MC salesman sample electro-mechanical lock display. As fun as turning the key and watching the latch smoothly retract and extend is, it was sort of lifeless without an actual door. I thought about using a wooden mini door, then about wrought iron garden gates. Grated iron wooden stove and furnace doors were given the greatest consideration, until I hit upon the idea of using a bank teller window grate. They had the look and solidity I was looking for, often came with a hinged door frame, and while pricier than some of the other options, could still be had for less than $100. The door I selected was wider and taller than I originally intended. It would occupy a great amount of space in front of my closest door, though not completely fill it. I decided I was going to need to fill the entire opening, and what could be better than a mock cell. But what to use as the cell walls? I had recently acquire a Michigan Department of Corrections No Trespassing sign but had no wall space to hang it. I decided that this would form the rear wall of the cell. I had also acquired a 32" wooden floor grate, that I bought to get some of my most prized locks off the floor and mount them on. A deco style wrought iron grate was purchased to serve as the west Wall. Unfortunately the seller could not locate that grate (he believed it might have been scrapped). This grate was 28" high, taller than typical floor grates. Every thing else in that size range had left me underwhelmed, and cost just as much or more than the one I wanted. I kept on coming back to the wooden grate earmarked for mounting locks. It looked good in my cell test mockups. It became my west wall. I knew I wanted a surface about 20 inches high to sit the gallows on. Since the Michigan Correction sign would be below, I knew I wanted the sign visible, as well as whatever or whomever might be in the "cell" below. This dictated a tempered glass surface, but it quickly became apparent it would be cheaper to acquire an entire used glass table. Using a glass table also meant I didn't have to create framing for the cell walls, I could merely tie surfaces to the frame of the glass table. The other reason I was hellbent on creating my own cell door was I really wanted this Southern Steel salesman sample door with Series 60 slam lock. The problem was I didn't have the enough money in Nov. So creating my own improvised cell door was going to be a broke man's substitute. By mid Dec, however I had worked a ton of holiday overtime and could afford the Southern Steel sample. There were still some gaps in the cell walls that needed filling. Quite accidentally I stumbled upon some Iron grate stove doors that looked like miniature cell doors a few hours before auction close. The bidding was still low and the shipping was reasonable. I dropped a snipe bid shortly before closing and snagged them for just a little above opening bid price. They arrive 3 days later and I was stunned how their addition completed the look. Suddenly it didn't just look like a single cell, but an entire penitentiary, with a yard, a gallows, gates, cells, transport vehicles entering and exiting- and Hannibal Lector. Two months ago I couldn't resist a bit kitsch and bought a Hannibal Lector escape scene diorama off of Ebay for $15. But where to put the erstwhile serial killer? The mock jail cell below seemed like the most obvious choice. But placing him on top of an exposed Folger Adam series 50 lock gave him an almost operatic presence. Next to him in the background is a custom notepad with a depiction of the San Quentin yards on the back cover (the front has a detailed relief of a jail cell door). Beside the book is an improvised Pauly style flat key that looks like one a Hannibal Lector type might create for their escape, but was more likely created by a jailsmith short on blanks. Taken all together, I didn't actually build anything, I just assembled disparate elements to create a montage. But the juxtapositions do take on a theatrical set quality I think. How do you think I'm doing so far? Superb! A collection to be proud of. Thanks for sharing with us. Thank you Doug and Phil. Just for the record, all of the locks in the above photo are the custom handiwork of Dennis Rider. This may be a shameless plug- but I want to shamelessly plug him. He makes beautiful mogul cylinder modifications to folger style locks. He also makes beautiful tradeshow displays. I've bought countless stuff from him and paid too little for it. People need to appreciate his craftsmanship. On one that just sold yesterday he truly outdid himself. It's He-Man chained to a bed in a Miami Vice style jail cell with a designer sink as part of another Southern Steel tradeshow sample. This truly is Art! He's got one more tradeshow sample jail door left if anyone is interested. Wow, some very cool stuff. I have purchased locks from Dennis on eBay before. Where can we see more of his work? Keep checking his Ebay page. He constantly is listing New stuff. Every time I think I have all there is to have something new surfaces. Or shoot him a message through Ebay. Fantastic items... I'm more than a little envious!